We’re all familiar with old-school, traditional marketing methods, right? You know, interruptive advertisements, blind email blasts and broad non-targeted messaging? That stuff. Its whole agenda was built on the basis of casting the widest possible net over the largest possible area. Toss and hope really… not particularly effective anymore. Then inbound arrived – and fortunately, inbound marketing is the opposite! It focuses on capturing people’s attention and providing them with exactly what they need. In order to do this, inbound marketing is founded upon creating and sharing personalised, quality, educational content which is tailored to a certain audience to help solve a particular problem or pain point. By using an inbound marketing strategy, you can naturally attract the types of customer you’re looking for through carefully crafted, fresh, targeted content. Yes, that means they come to you, and It’s super effective. The inbound marketing methodology is made up of four stages – attract, convert, close and delight. At each stage a different style and type of targeted content is needed, which helps to push our prospects further along the marketing funnel, and in turn, the sales process. Marketing funnel? What's a marketing funnel? Yes, we are referring to an actual funnel. No, we don’t push prospects down a real funnel. It’s symbolic. Chances are, you probably know what a marketing funnel is and you’ve probably been exposed to one already, but – how can you use that funnel to determine your content strategy? A funnel, by definition is a: ‘tube or pipe that is wide at the top and narrow at the bottom, used for guiding liquid or power into a small opening’. This ‘symbolic’ funnel operates exactly like a real one, except instead of liquid or powder, we have prospects and inside the funnel, a number of checkpoints or stages which we use to filter our potential prospects. These checkpoints or stages help us to determine where our prospects are in their journey; whether they’re at the top, the middle or at the bottom of the funnel. By corresponding a prospect’s position to an individual stage, marketers can use the funnel to determine what content to use to push these leads down the funnel and what stages of the funnel are working (or not – and then fix them). Acts as a method of transport, allowing to determine exactly a prospect’s position. Show you what content you’re delivering at each stage of the funnel. Help you decide on what you need to do in order to get them from the top of the funnel to the bottom – and exit as a customer. Identify possible problems that might arise in a buyer’s journey and fix them accordingly. But as every business is unique, so is every funnel. In order to tap into the reservoir of prospects, you need to design a specific buyer’s journey, relevant to your business. Let’s start with the funnel stages and the content that resides within them. At the beginning of our journey, we have the top of the funnel. Referred to as TOFU, this is where prospects are looking for answers or options to resolve a particular problem. At this point, they’re simply trying to develop an awareness of what solutions are available to them. So, to generate interest in your business, you need to show off your expertise and industry authority – and you can do this through creating content which is exciting, inspiring or thought-provoking. Top of the funnel content should be exceptional at building awareness and coverage, but pales in comparison to consideration and decision stage content for driving leads to a point. Don’t get too excited and don’t be the crazy salesperson at this stage; there is no need to throw your product or service around – you’ll put your potential customers off. Instead, look to provide knowledgeable answers and support regarding the issues your prospects are facing and then point them in the right direction. If your content helps them narrow down their options, they’ll be thankful and more likely to remember your business in the future. Moreover by also demonstrating ability and market expertise through an extensive knowledge of the subject area, you will encourage those who found your information useful to share it with others. Whenever your prospects do come back at the decision stage – they’ll be looking for your business! Remember, this part of the stage is all about building awareness and credibility in both your niche area of expertise and the wider market. The middle of the funnel represents the part where your customers are considering a specific solution and have come to you for some advice. Essentially, they’re trying to compare and contrast the options they’ve shortlisted after the awareness stage. At this point in the funnel, it’s fine for you to start talking about your industry solutions and how you believe your products, services or offerings can assist them in fixing their problem. However, exercise caution and don’t become arrogant. You’re not selling just yet, you’re simply showing why your solutions are the most effective – you may want to use case-studies as your go-to content in that regard. Make sure that your products, services and the content you want your customers to read is readily available and easily accessible. You want them to leave your website feeling thoroughly educated and absolutely certain as to who they want to work with – and why that should be you! Remember, this part of the funnel is all about conveying your ability to solve their problem! You need specifically targeted content which will convey that message. As your prospects travel past the middle of the funnel towards the bottom, they transform from prospects to potential leads – and at this point, they’re more likely to want to speak to a salesperson. So let’s head onto the decision stage. So we’ve arrived, we’ve pushed, pulled and carried our prospects to this point: It’s time to get specific with your content. At this point, your potential customers have decided on the options available to them, and they’re looking for the best possible solution for their problem. Therefore, at the bottom of the funnel, you need detailed content about your products and service offerings to clearly distinguish why they should choose you, as well as practical data to highlight your ability to solve that problem. Remember, this point of the funnel is all about you. Prospects at this stage are usually qualified leads, who are ready to potentially speak to a sales representative. Unleash the salesperson! 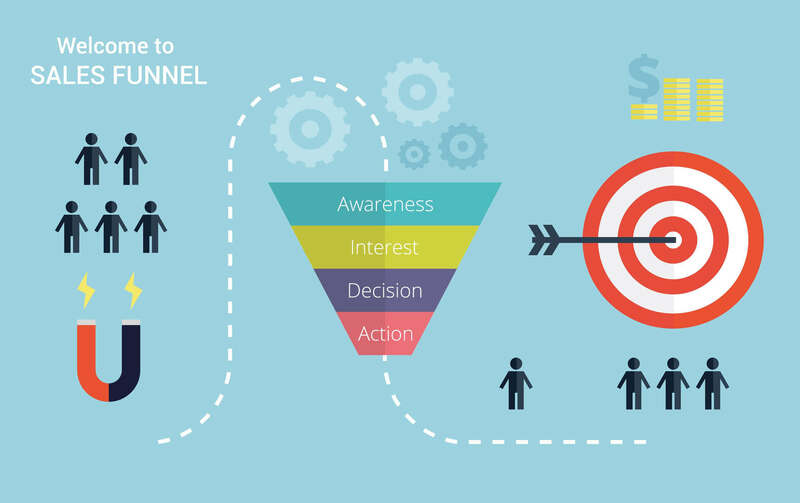 Using the marketing funnel to inform your inbound content marketing strategy enables businesses to make simple, logical decisions about what content should be delivered at which point of the sales process. If you want to capture the right attention, you need a well-developed and structured funnel! But no funnel is complete without buyer personas. In order to truly reach the right audience, you need detailed and accurate buyer personas. We’ve mentioned the need to personalise and tailor content to your audience and that’s where buyer personas come in, but we’ll discuss that in another blog!